Rabia Esserghini proprietária do restaurante Flor da Laranja garante que este é o único verdadeiramente marroquino no centro de Lisboa. Há tajines de borrego com ameixas caramelizadas, que acompanham com batata doce, sultanas, mel e canela, favas com azeite e azeitonas, espinafres com limão ou beringela com tomate, ou cuscuz tradicional. Só abre ao jantar, e o melhor é garantir a reserva de mesa para esta viagem de sabores, cheiros e cores marroqinas. Rabia Esserghini, owner of the Flor da Laranja restaurant ensures that this is the only truly Moroccan in the center of Lisbon. 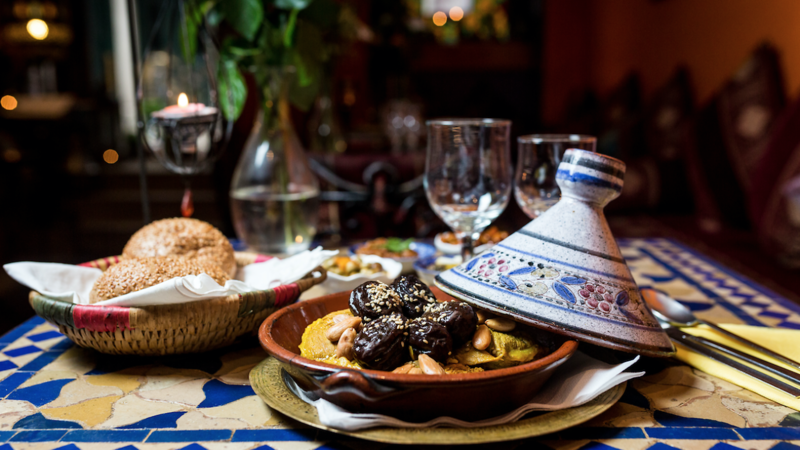 There are lamb tajines with caramelized plums, which accompany with sweet potatoes, sultanas, honey and cinnamon, beans with olive oil and olives, spinach with lemon or eggplant with tomato, or traditional couscous. Only open for dinner, and it is best to guarantee the table reservation for this trip of Moroccan flavors, smells and colors.